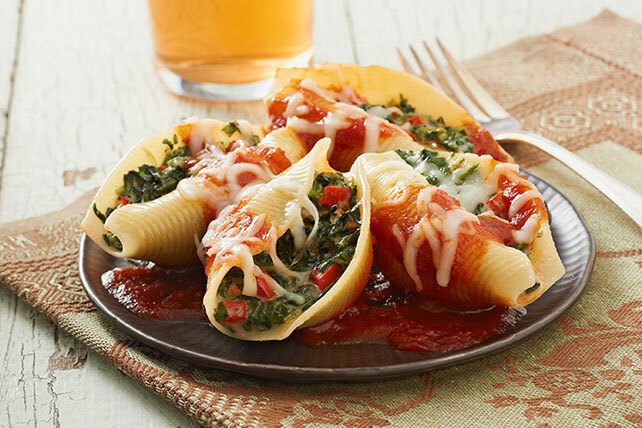 Fill up your pasta with an incredibly tasty, creamy filling with this unforgettable Scrumptious Stuffed Shells recipe at your disposal. Combine first 5 ingredients. Stir in 1/2 cup mozzarella; spoon into shells. Spread half the sauce onto bottom of 13x9-inch baking dish. Place shells in dish; top with remaining sauce and mozzarella. Cover. Serve with hot crusty bread, and a fresh green salad tossed with your favorite KRAFT Lite Dressing. Save 380mg of sodium per serving by preparing with reduced-sodium low-fat cottage cheese and low-sodium pasta sauce.